Heat oven to 350°F. Grease 8-inch square (2-quart) glass baking dish with butter or cooking spray. In large bowl, mix rhubarb, brown sugar, vanilla and lemon juice. Pour mixture into baking dish. In small bowl, stir together Bisquick mix, butter and milk with fork just until combined. Using hands, break dough into small pieces and sprinkle evenly over rhubarb mixture. Bake 40 to 45 minutes or until topping is golden brown and fruit is bubbly. 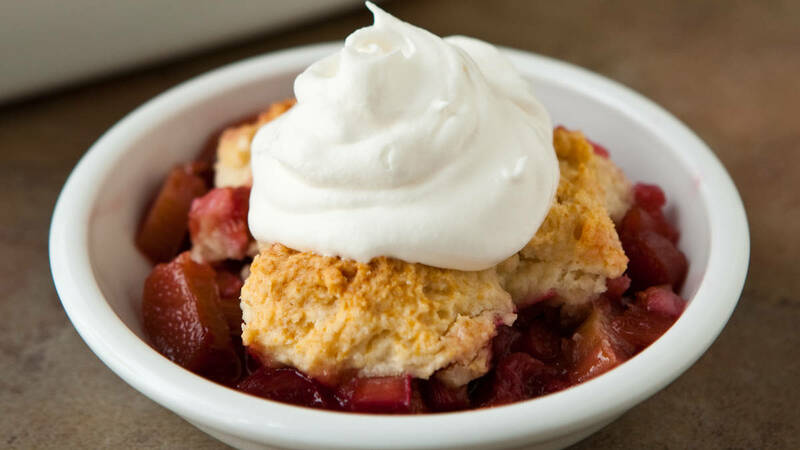 To serve, scoop warm cobbler into bowls; top with whipped cream. For a sweeter cobbler, use 1 cup brown sugar. The recipe can easily be doubled—bake in a 13x9-inch (3-quart) glass baking dish.